Are there specific broadband deals for pensioners? The internet has revolutionised the way we live. We shop online, pay our bills, search for new homes, book holidays, manage finances, pay our TV licence or council tax. While it may seem complicated and unnecessary, more and more services are moving to the internet. That means having broadband at home is now a necessity rather than a luxury. You can keep in touch with family, browse the internet, send and receive emails, talk to people on Skype and stay in contact with the world at large. Some broadband providers offer special deals for the elderly. These can offer good savings or provide useful extras, but not all of them. Sometimes, other offers not related to age make more financial sense, so shopping around is a must. Just because a service may be advertised as being good for seniors, doesn’t mean there aren’t better offers elsewhere! BT Basic + Broadband is a BT deal aimed at those with limited resources. It provides telephone line rental and a basic broadband package for people who want an internet connection but won’t use it very often, or who cannot afford other packages. While not specifically for pensioners, it is worth looking at if you need a very cheap internet service. Virgin Media Talk Protected is the company’s commitment to freezing line rental for the elderly or disabled. It means that the price you pay when you sign up is the price you will pay throughout your time with the company. The deal also includes free calls too. You may not have heard of POP Telecom before but they have been around a little while and offer a special deal for older users. The POP Telecom Over 50 Plan includes broadband and anytime calls, with a bonus of extra customer support and a price guarantee. Other broadband providers may also have special packages for senior users. But as mentioned above, they may not always offer the best deal available so shop around before you buy! If this is your first time comparing broadband deals, it may initially seem daunting. It shouldn’t put you off though. Shopping for a good broadband deal is exactly the same as switching energy providers or shopping around for cheap insurance. You assess what you need, consider what features are most important to you, then find a deal that fits your requirements at the right price. Assess your needs by seeing how long you spend on the phone each month, and how long you spend online or think you might spend online. Also consider how the connection is going to be used; web browsing, social media and email don't need a fast connection, but activities like streaming video (Netflix, iPlayer, etc) or transferring files are a lot more demanding. Take into account the number of users too, as the more people sharing the broadband the faster it will need to be. Read our guide to broadband speed for more help. Use the Broadband Genie comparison tools. Enter your postcode into the table to filter by location, and look through all the deals. Use your needs from Step 1 to see which is the best deal for you. Click on a deal and follow the registration steps. Wait for your broadband to go live! Once you have signed up for a deal the provider should confirm by email and give you an estimated date for your service to begin. If an engineer needs to visit, they will confirm a date and time for that too. Typically, the lead is around two weeks from the date you signed up to the date your connection goes live. You can learn more about the activation process in our dedicated broadband installation guide. Older users can sometimes need a little extra help setting everything up and the customer services representatives of your broadband provider are there to do just that. If you think you may need that extra help, look to see the main operating hours of the customer service helpline. They need to be there when you need them most! Price is obviously important when choosing any product or service and that’s no different here. Assessing whether the broadband package is good value is another matter. Once you know how often you will use your phone and broadband, you can use that to decide whether any deal is a good one or not. Some broadband contracts are for one month, some for 12 months and some for 18 or 24. Generally, the longer the contract the lower the monthly charge. Choose a contract length to suit you. Longer contracts may be cheaper but you are then locked in, and early cancellation can be expensive. If you use the telephone the included minutes with any broadband deal are important. Many will offer free evening and weekend calls as part of the package, but some may charge on a pay-as-you-use basis. You can also opt to upgrade to anytime or international calling. If you use your phone a lot, make sure to check what you get for your money! 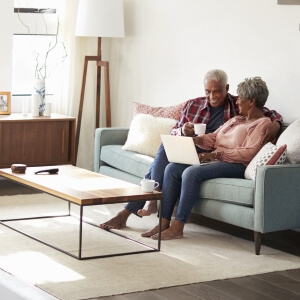 In selecting the best broadband providers for pensioners, we looked at our Home Broadband Survey. If a company scored well for value, customer service and quality, we regard it as a good provider for older users. Plusnet. The best broadband provider overall. They score very well for customer care and for reliability. Two things that are very important in broadband! Plusnet is also good value, with packages available from under £20, and regular rewards and freebies. Vodafone. Scored best for value and came fourth in customer care. Vodafone offers very cheap fibre optic broadband deals. EE. Second for customer services, fourth for reliability and third for value. Good value all round, especially if you're an EE Mobile customer as you can benefit from free data boosts. Of course these are just a few of the providers available. Take a look at our broadband deals and use our comparison tools to help you find a package that suits. The highest rated provider may not necessarily be the cheapest so balance this with your priorities to help make a decision. Even though you may be looking for an internet connection, most broadband packages include line rental for a landline. This is usually because the landline is required for internet access. If you would prefer broadband without a phone line you can get this from Virgin Media. If you can't get or don't want Virgin Media, and you don't plan on making voice calls, then a broadband only deal can give you internet with a landline but without inclusive calls. If the phone is regularly used then an inclusive calling package can be good value as you avoid charges for individual calls. Many broadband deals offer inclusive calls, others offer it as a premium extra. If you don’t want those inclusive calls when you sign up but want them later, you can often add them to your account whenever you like. Inclusive calls are useful if you use the phone a lot or like to keep your bill predictable. If all you use are your free calls, your monthly bill should always be the same! You sign up to your broadband contract and pay the first month plus any setup costs. You receive an email confirmation telling you what you have bought. You will be contacted within a few days scheduling your broadband activation. An engineer may visit to install your connection (this is not always necessary). An engineer may visit to connect you to the internet. In some cases they might need to come into your house. The company should tell you well in advance and arrange a suitable time. Even if the engineer doesn’t need to work in your house, you will need to be home to sign a form to say they have connected you and everything works. Don’t sign anything until the engineer has shown you that your internet is live and you have tested it. It could take some time for them to return if it doesn’t work properly! If an engineer is not required you will be expected to do a DIY install. All this should involve is plugging in a Wi-Fi router (and perhaps a separate modem) on the day the broadband is activated. If you're not sure about this the customer service team will be able to guide you through it. For further information on this topic see our in-depth guides to broadband installation and activation, and new phone line installations.